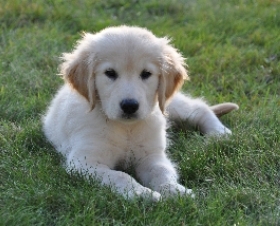 Yankee’s Breeder Referral program provides prospective Golden Retriever owners with information to assist with the purchase of a carefully bred Golden Retriever puppy or adult. Puppies and dogs listed in the referral program are from parents who have passed a number of important health tests for hereditary disorders. Acceptance of a listing to Breeder Referral does not constitute endorsement by YGRC or any of its members. Neither the Yankee Golden Retriever Club nor its Board of Directors assumes responsibility for the quality, health, soundness, or temperament of any litters listed. Eye clearances (CERF or OFA certificates) on both the sire and dam, current at the time of breeding. Hip clearances (OFA Certification or Penn Hip) on both the sire and dam. Elbow clearances (OFA Certification) on both the sire and dam. Heart clearances on both the sire and dam, issued by a veterinary cardiologist who is certified by the ACVIM (Cardiology). Yankee Golden Retriever Club recommends that a fully executed, written purchase agreement setting forth all the terms of purchase be obtained before possession of a puppy is transferred from the breeder to the purchaser. Please contact the Yankee Golden Retriever Club Breeder Referral Volunteer closest to your home. Our volunteers will do their best to help you and your family in your search for a Golden Retriever by providing you with the names and telephone numbers of breeders who have most recently submitted the required information. When you find your puppy, remember to enroll him/her in Puppy Kindergarten. Early training and socialization are critical to a well-behaved companion. Yankee offers classes for Golden Retriever puppies.